Colony Club at 3118 Georgia is having a party with no cover, a food truck, beer deals, karaoke, face painting, DJs, a funk band and more. 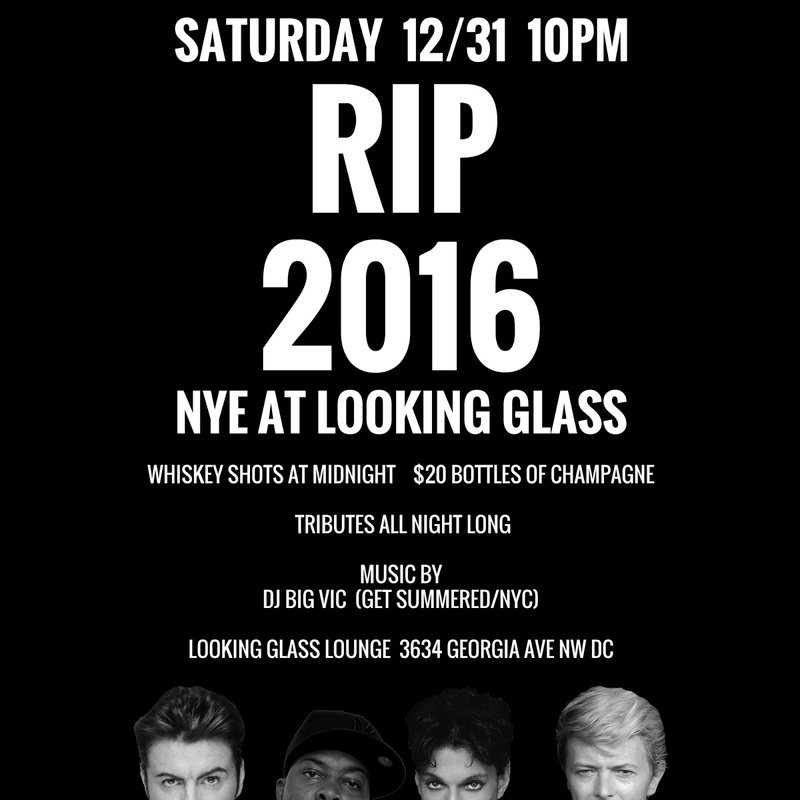 Looking Glass also has no cover with a free whiskey shot at midnight, $20 champagne bottles, $6 beer and shot deals and tributes all night. Here's their Facebook invite. No cover at the Midlands too with live music starting at 9 pm. Wonderland has a toast at midnight and DJs, plus brunch all day and a $10 cover, or $15 for couples. Little Coco's at 14th and Randolph is doing two seatings for dinner, a 3 course and 5 course option. It sounds delicious. The Red Derby is doing a "Decades of Decadence" party: 1977 upstairs and 1997 downstairs with deals and decade-specific drinks and shots. 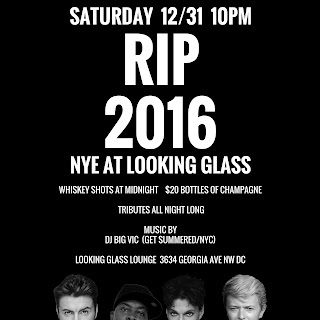 No cover and a free champagne toast at midnight! They have an 80s brunch from 11am-5pm on the 31st too. For a more relaxed vibe, Room 11 is just doing their regular thing, as is Lyman's. 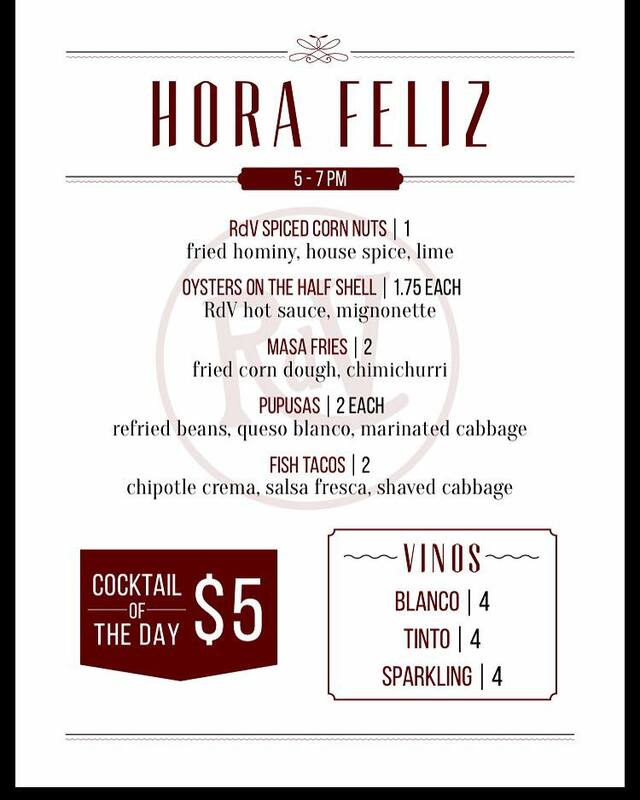 El Chucho is doing an "all you can Mexican" New Years with unlimited tacos plus tips and salsa for the table and elote for each person, and drinks for $56.17, and I think also unlimited margaritas and draft beer. Thip Khao is also doing a prix-fixe meal from 5-8 pm. Any other good options? Leave them in the comments! Just wanted to let you guys know that we’ll be celebrating Festivus here again at The Airedale on December 23rd! 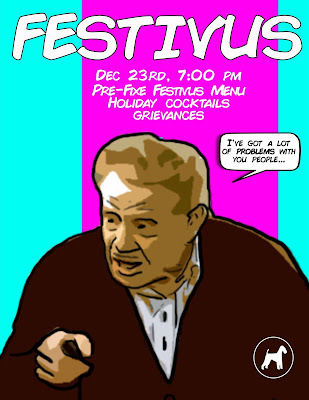 Just like last time we will have a Festivus-inspired pre-fixe menu and themed cocktails all night (Feats of Strength, Cosmo Kramers) . We also invite you to air your grievances around our authentic Aluminum Festivus pole (and experience its excellent strength-to-weight ratio). There will be no tinsel. We find it distracting. 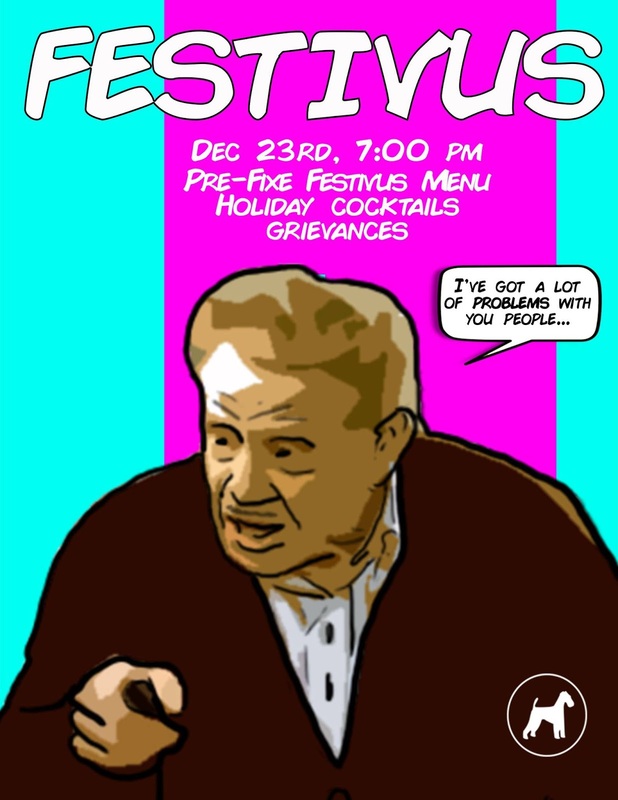 Festivus, in case you aren't familiar, is a hilarious fake holiday invented on Seinfeld. And even if you are familiar, this is still funny. They're at 3615 14th Street NW, here's their Facebook page and the event page for Festivus. The holidays are coming up, and I was thinking about local options for buying gifts from local small businesses in our area. Here's what I've come up with, and let us know in the comments if you have others! Coffee bags from Qualia Coffee or Harrar Roastery, both on Georgia Avenue. Both roast their beans themselves. Room 11 also carries coffee beans and Colony Club also has lots of coffee equipment for sale like French presses, pourovers and aeropresses. There are some nice vintage stores in the area too, like Mom n Pop on Georgia, and Bentley's and Fia's Fabulous Finds on Upshur -- you could get a gift certificate or find something interesting. Attic DC is also selling gift cards that works at numerous vintage stores. 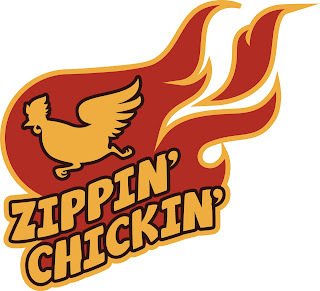 There's a new food option in the area, as Zippin' Chickin' and Fish has just opened at 2901 Georgia, at the corner of Georgia and Harvard. The space was previously A&H Catering (which is owned by the same person, DJ Jordan) and they have renovated the inside and outside. The menu is pretty big: fried chicken, chicken and waffles, fried catfish and shrimp, crusted fish filet, chicken and fish sandwiches, shrimp po'boys and more. Sandwiches run from $3.50 to $8 and entrees are the same, so pretty reasonable. They also offer combo meals up to $12 and sides: crispy french fries, fried rice, cole slaw, collard greens, onion rings, mac & cheese, potato salad, and a vegetable of the day, plus corn muffins or hush puppies. Sounds pretty delicious. Here's more about the spot, which also has a food truck. They're also planning to open a patio in the Spring. This is to announce the Grand Opening of Zippin' Chickin' & Fish. We had our "soft" opening during the month of October 2016. We've fine tuned some things and at 11:00 am on Wednesday, 14 December 2016, our take out windows are up to take your order. Take a look at our Special Board, posted right in the front and on the side of the building. We offer a Chickin & Fish special daily, as well as a Chickin & Seafood soup, daily. We will operate on Winter Hours during the months of December 2016, January, and February 2017. Starting the 15th of January 2017, we will start taking call-in orders. And in March 2017, we will start our Saturday and Sunday brunch service, featuring Shrimp & Grits and Chickin & Waffles. Our menus are up, so check them out on the building or on our web site, "zippinchickin.com" and like us on Facebook - "zippinchickin" Follow our food truck and see where it goes. Though our ten independent, nonprofit neighborhood Main Street programs, we revitalize communities by retaining and recruiting businesses, improving commercial properties and streetscapes, and attracting consumers. Leaders in these neighborhood organizations assist businesses and coordinate sustainable community-driven revitalization efforts in their neighborhoods. As for general plans, we will continue to host community events that bring people together, work with local businesses to connect them with resources and support to grow and thrive in the neighborhood, and work to continue to build unique partnership across sectors. We will be working with both Mount Pleasant and Columbia Heights to serve and connect both neighborhoods- while maintaining and celebrating their distinct identities. Here's more about the Main Street program from the city. Dupont, Shaw, Barracks Row and H Street are other areas with Main Street groups. (WASHINGTON, D.C.) – The Columbia Heights Initiative has been announced as the newest designee of the DC Main Streets program by the Department of Small and Local Business Development (DSLBD). Their Columbia Heights/Mount Pleasant Main Street will join eleven other DC Main Streets programs that have been accredited through DC Main Streets and the National Main Street Center, Inc. As a DC Main Street designee, Columbia Heights Initiative will implement programs and services to support the growth and development of neighborhood businesses and the revitalization of the commercial corridors of Columbia Heights and Mount Pleasant. 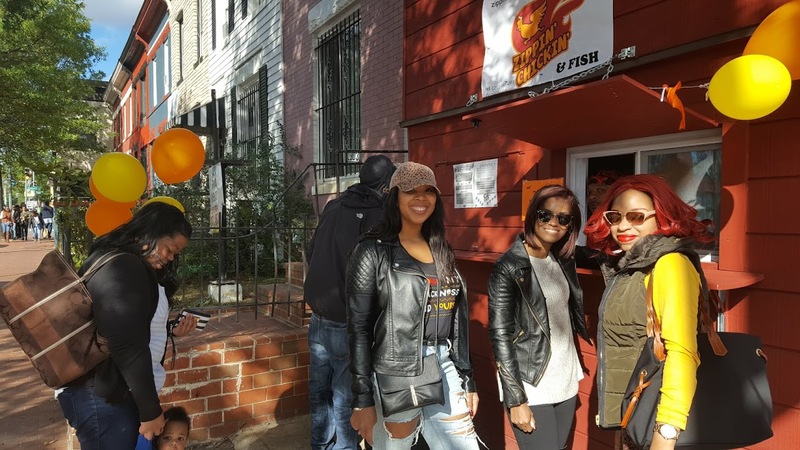 The Columbia Heights Initiative, responsible for the eleven-year running of the Columbia Heights Day festival, took major strides to develop into a stronger community organization over the past year. In 2016, the Columbia Heights Initiative volunteer Board of Directors hired Brianne Dornbush as the nonprofit’s first Executive Director. Under their collective leadership, the organization profoundly expanded its presence and impact in the community by introducing a series of new community events, creating monthly volunteer and networking opportunities, developing a business and nonprofit network, and building an enthusiastic and active volunteer corps. The $200,000 grant from DSLBD will allow the Columbia Heights Initiative to provide technical assistance to support capacity building, business retention, program design and implementation, and commercial-revitalization planning to maintain the traditional and unique character of the distinct neighborhoods included in the Columbia Heights/Mount Pleasant Main Street boundaries. DC Main Streets, managed by DSLBD, is the coordinating agency that oversees the locally designated nonprofit Main Streets organizations. Funding is made possible through the Commercial Revitalization Assistance Fund. The grant will be matched with private-sector funds raised by Columbia Heights Initiative. Columbia Heights Initiative’s commitment to the community and intentional relationship development has garnered broad community support, ideally positioning the organization to manage this new Main Street Program. 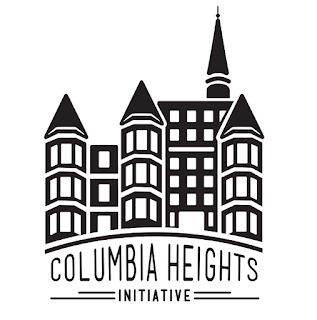 In celebration of this award and the impact of the organization over the last year, the Columbia Heights Initiative is hosting its inaugural Columbia Heights Night gala fundraiser on Friday, December 2nd at 7pm. The evening will feature a “Taste of Columbia Heights” buffet catered by some of the neighborhood’s beloved restaurants, live local music by the Harry Bells, a silent auction, and specialty gifts and raffles. 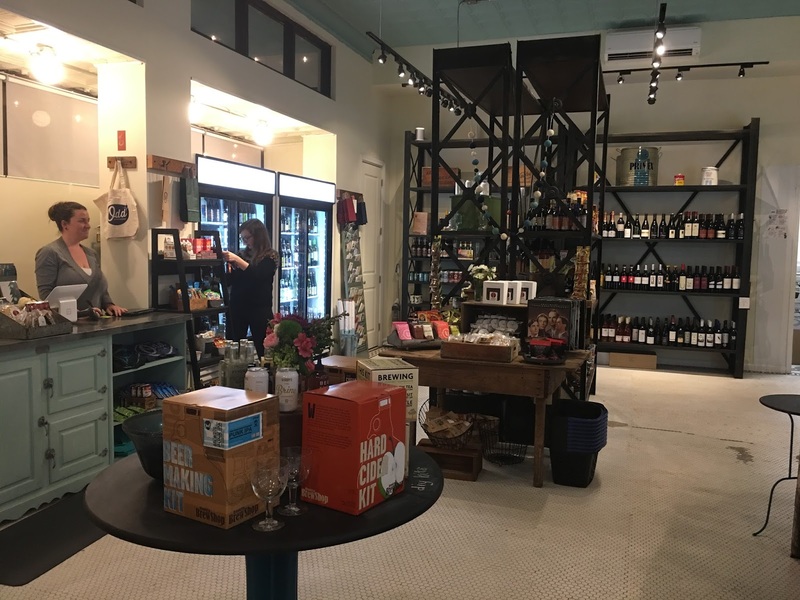 The proceeds from this event will go toward supporting the continued growth of the organization as it works to build a successful DC Main Street Program in Columbia Heights and Mount Pleasant. Tickets can be purchased for $75 through the Columbia Heights Initiative website at cohidc.org. The City Paper reports that celebrity chef Alex McCoy is closing Cajun spot Tchoup's Market on Dec. 23, and will be giving up the lease when it expires in 2017. They'll be hosting various private dinners and pop-ups until then. And on Twitter, he said at the time that they're not leaving and love the neighborhood, plus something similar on Facebook. I guess the "not leaving" and "love" parts only extend until May 2017. What else is strange is that the City Paper says the move is so they can focus on the new location of Alfie's, but they still don't know where it will be. McCoy will instead be popping up Alfie's in New York, London and Bangkok in the future. Tchoup's has also been the home of the Nok Noi Thai noodle pop-up on Wednesdays and Thursdays. That will presumably also be going away. The article also doesn't mention the British sandwich place he was supposedly opening on Upshur Street, just that he owns the building. That doesn't seem like a great sign either. 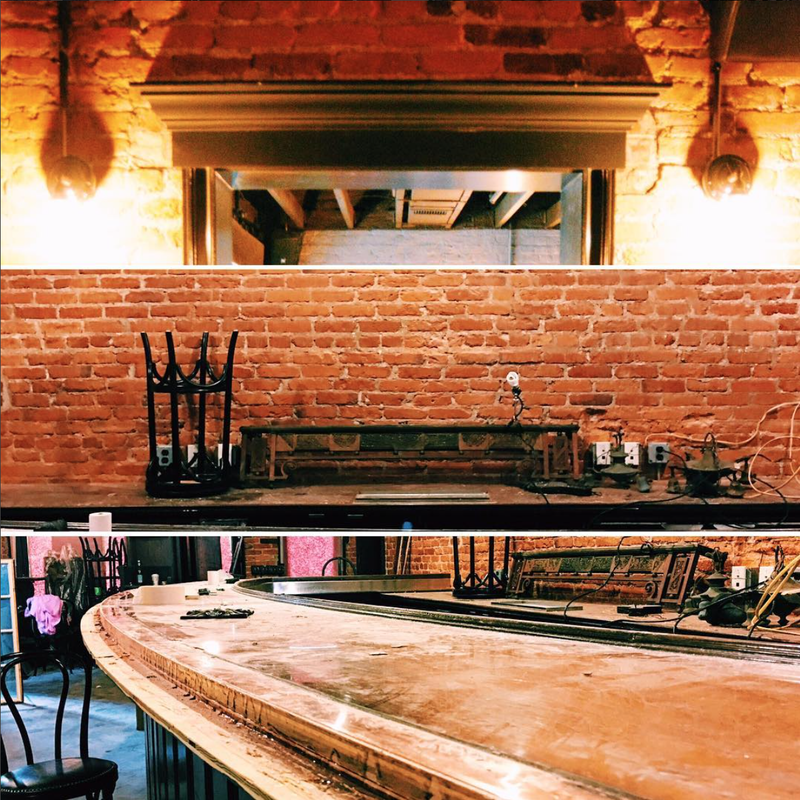 If you like the Tchoup's food or vibe, better check it out soon. Or don't, he doesn't seem to care either way. UPDATE: On Twitter they told me they're currently working on the British sandwich place on Upshur, so at least a small bright spot. 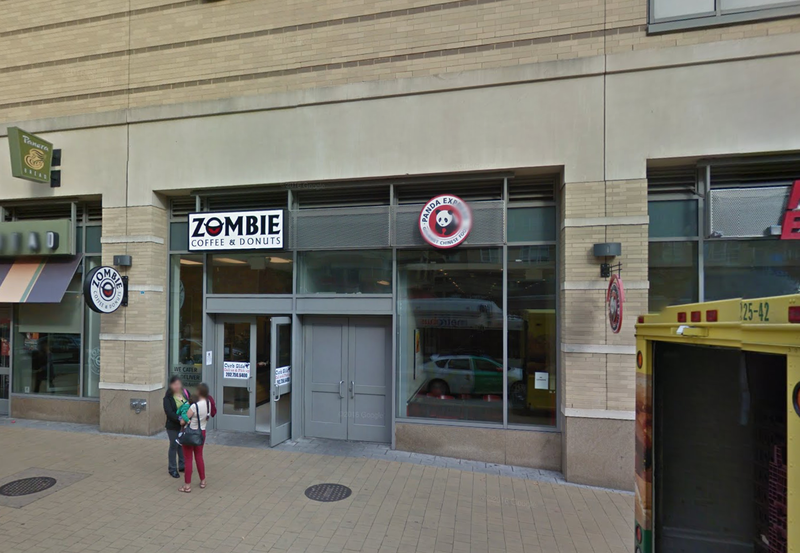 Well, there's one fewer coffee option in the hood: PoP reports that Zombie Coffee and Donuts has closed. To be honest I always forgot about this place and I've never been, but I know some folks are fans. Anybody miss it? I wonder what will come next? This spot was formerly Tasti D-Lite, a frozen custard place that didn't last very long. Maybe Julia's Empanadas will make a return to our neighborhood? If you need a coffee fix, Tynan across the street is pretty solid, as is Coffy Cafe up the street, Qualia, Harrar, Heat da Spot and Colony Club. 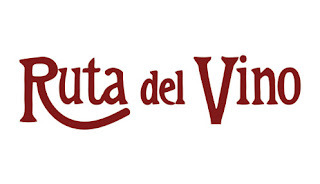 Upshur Street and Petworth have been blowing up lately with new restaurants and bars, and another new one seems to be a hit: Ruta del Vino, a Latin American restaurant that opened earlier this month at 800 Upshur, the old Riyad Market. 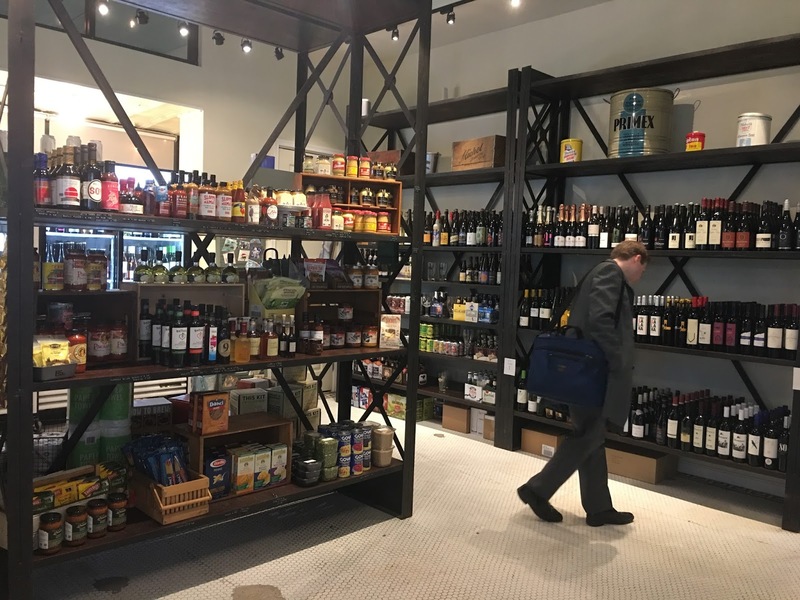 Washington Post food critic Tom Sietsema wrote about the spot earlier this month, saying it had "all the makings of a neighborhood hit." He raved about the grilled octopus, ceviche, carne asada, roast chicken, and more. He wasn't a fan of the Cubano sandwich though, which was echoed on Yelp. 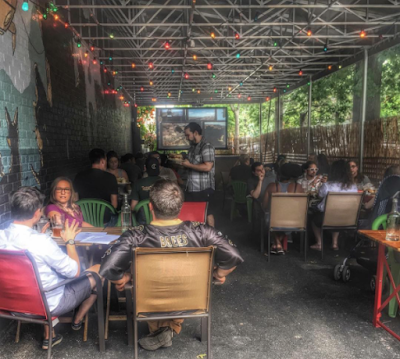 He also liked the wines and reasonable prices for cocktails and happy hour deals -- for example, the spot has happy hour with $5 cocktails of the day, $4 glasses of wine and $2 snacks like fish tacos, pupusas or masa fries from 5-7pm, which is pretty great. See below for the info. The Post article also has some nice photos; the place looks great inside. It was opened by Justin Logan, a trained chef who formerly worked at the Cato Institute but loved Latin American food. Yelpers love it too, with 4.5 stars so far from only 6 reviews. Have you been? I'll have to check it out. They're open Mon-Thurs 5-10pm and Fri-Sat 5pm-11pm, with later hours each day for the bar. They're closed Sundays. 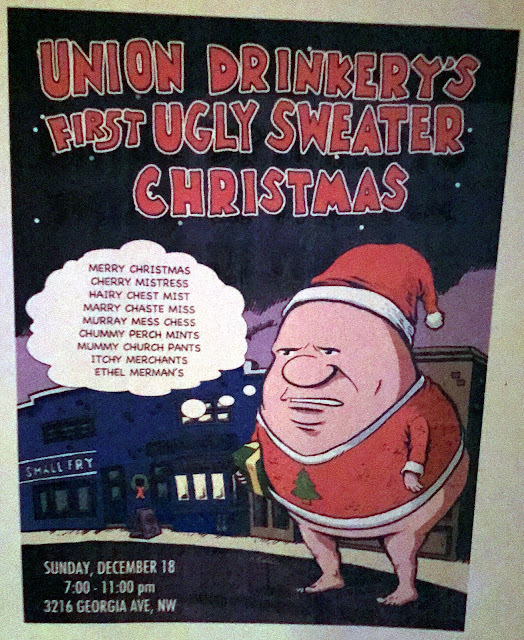 Union Drinkery, the great new bar at 3216 Georgia from the A&D and Sundevich folks, is doing a fun event on Dec. 18, an ugly sweater party from 7-11pm. The spot, if you haven't been, is an awesome, chill neighborhood cocktail bar with good prices and food from the neighboring Small Fry -- things like BBQ, poutine, sandwiches and the like. It's a great spot with a good vibe, plus a nice outdoor area. Definitely worth swinging by. 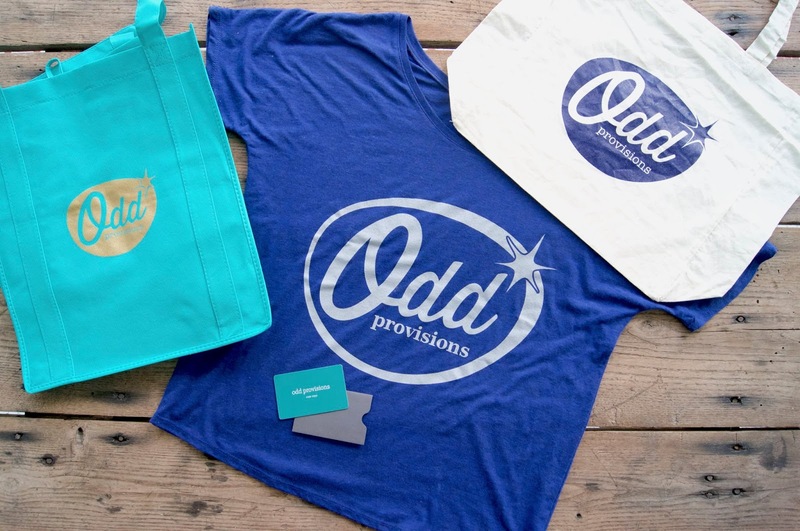 Last night I popped into Odd Provisions, the cool new corner store from Room 11 alums Jess Woods and Rachel Mowrer at 11th and Lamont, and I really liked it. It's a one stop shop for a lot of things, and they have really good quality stuff. They have a lot of produce, beer and wine, snacks, and lots of groceries from local and craft vendors, as well as nice frozen items, baked goods and in-house premade things like sandwiches and salads. There's also a lot of kitchen staples like olive oil, pasta and pasta sauce, and a lot more. 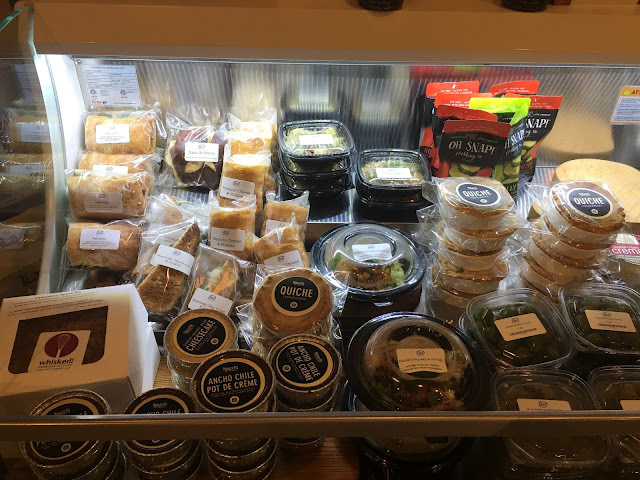 Woods said the premade sandwiches and salads have been popular, especially a pimento cheese sandwich that was selling so well they started selling just the pimento cheese separately. The baked goods are from Paisley Fig, which also makes them for Room 11 -- other things available were quiche, the pot de creme from Room 11, cheesecake and more. I plan to go back for one of those sandwiches soon. I didn't snap a good photo of the produce but it looked pretty nice too, and there was a wide range of things, plus eggs and dairy items. They also have ice cream from Milk Cult -- remember them, they had a tasty coffee, breakfast sandwich and ice cream sandwich popup on Georgia Avenue a couple of years ago. 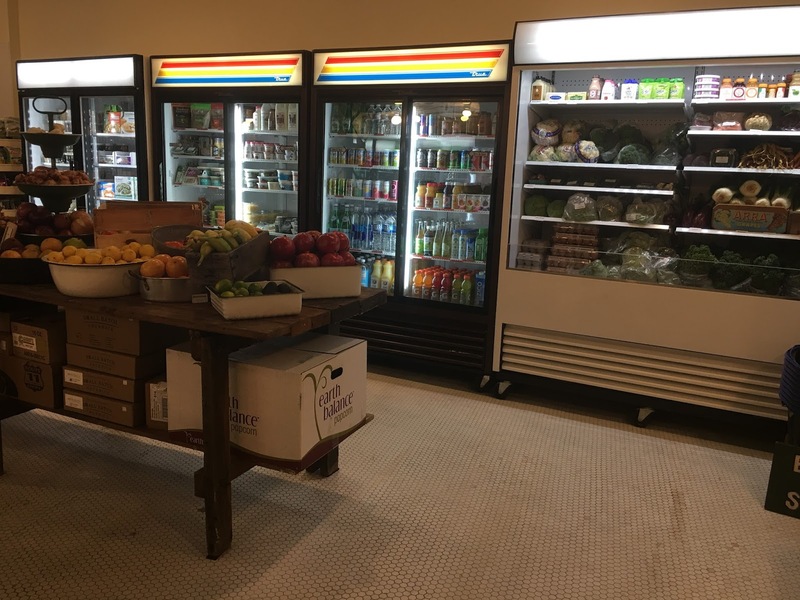 It looks like they re-used some of the old refrigerators from the former tenant, Arthur's Grocery. There was also a nice beer and wine selection, I picked up some Ghost White IPA from Three Stars. The beers ranged from six packs to bigger bottles of fancy craft beers, a lot of it local or from small breweries. Woods said planned to start offering coffee in January, as well as possibly longer hours too. Currently they're open 11am-9pm. It's definitely a neat, convenient spot, and they have a lot of what you're probably looking for. Also sounds like a good spot for a tasty to go lunch or dinner. They also have an online shop on their website. In October we learned that the replacement for Chez Billy was going to be Ten Tigers Parlour, an "Asian street food lounge" from chef Tim Ma and the Hilton brothers, who run the Gibson and many other spots around town. And now we know when: the Washingtonian reports it's opening Saturday. The place looks amazing from their photos, and sounds pretty cool too: they'll feature soup dumplings, inexpensive cocktails, and other Asian inspired fare for dinner, as well donburi rice bowls, skewers, bao (buns) and noodle dishes, which will be available for lunch and dinner both. They'll also be open during the day with tea and coffee. The prices seem reasonable too, like $12 for the handmade pork, chicken or veggie soup dumplings and $11 for Marco Polo noodles, an Italian-Chinese fusion dish. 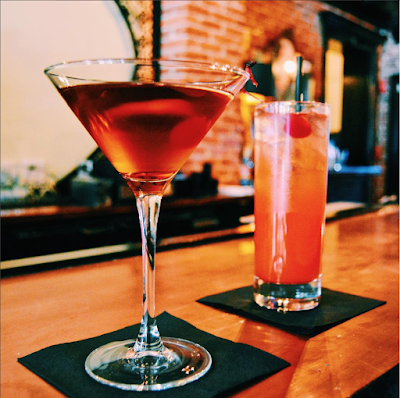 Drinks and beers will also be reasonable with things like a gin and tonic for $5 or $6 up to $10 for a Thai whiskey manhattan, plus lots of "aggressive" happy hour deals. The City Paper has more on the menu, with items like a variety of pan fried dumplings and other dishes, all ranging from $7-$12 -- three types each of soup dumplings, skewers, noodle dishes, bao, and rice donburi with a few veggie options. The pricing sounds like they learned a lesson from Chez Billy, which had to drop their prices after being open for a while. "We’re trying to make it flexible for the neighborhood," Ian Hilton said to Washingtonian. "I feel good about the fact that they’ve told me what they want." During the day, they open at 11am with free wifi and plugs for laptops and things like Vietnamese and French press coffee, Thai ice tea, and bubble tea. Eventually they'll add Chinese sweets and pastries too. Sounds like it could be a great spot for folks who work from home. The City Paper says the interior will look "unrecognizable" to fans of Chez Billy, but to me it's pretty similar with more old timey Asian art like tapestries, though they have changed the layout somewhat. They're open 11am-2am Sunday-Thursday with food service til 9, and 11am-3am on Friday and Saturday with food service til 10. They're at 3813 Georgia Avenue NW. Their website is up but there's not much on it. Photos from their Instagram. Here's an awesome way to help DC SCORES, the local nonprofit that provides after school programs for kids with poetry and soccer. 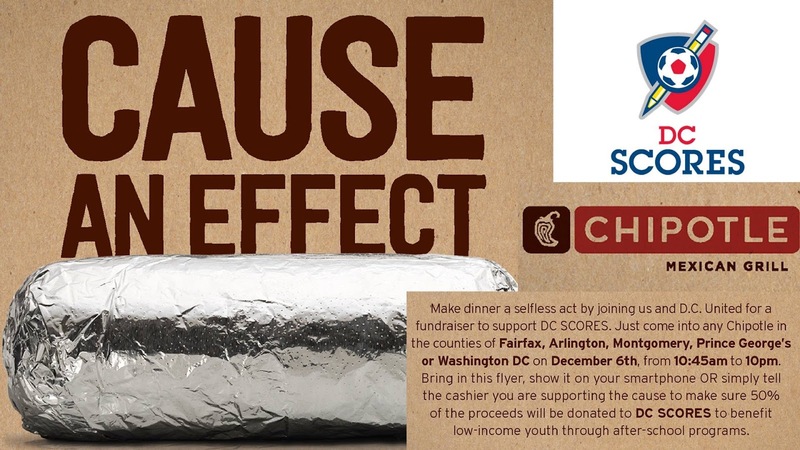 And all you have to do is eat at any Chipotle in the city and bring the above flyer, show it to the casher on your phone, or just tell them you're supporting DC SCORES! Pretty awesome! It runs from 10:45am to 10pm and they'll provide 50% of the proceeds to DC SCORES. Here's more about DC SCORES. DC SCORES has a team-based approach for providing youth with the arts, athletics, and academics that will engage and enrich their lives. DC SCORES builds teams through after-school programs for 1,500 low-income DC youth at 44 schools by instilling self- expression, physical fitness, and a sense of community. DC SCORES accomplishes this in an innovative model combining poetry and spoken word, soccer, and service-learning year-round. We have worked with over 8,000 students since our founding in 1994 and we aim to serve EVERY child in the District deserving of a team who does not have one. The Zoning Commission will hold hearings on the requested zoning changes for the Bruce Monroe Park on December 5th and on the Park Morton site on December 8th. You are welcome to testify at the hearing from 6:30-9:30 pm at 441 4th St NW (Jerrily R. Kress Memorial Hearing Room). The hearing is an opportunity for you to voice your views about the project. If you can’t testify in person, you can still voice your opinion by sending a letter to the Commission via email by Monday, Dec. 5 at 2:00 p.m. The Christ Embassy Church will host a food ministry at the Emergence Community Arts Collective – 733 Euclid St. NW on the first and third Mondays. Anyone is welcome to pick up an assortment of free fresh fruits and vegetables during these hours. RSVPs are helpful, but not required. Distribution will be first come, first served until the food runs out. To RSVP, contact Sylvia at (202) 462-2285 or sylvia@ecacollective.org We will also need volunteers to help with unloading and distribution from 4-7pm. Meet your neighbors, learn more about UNC activities and celebrate the close of 2016 from 7-8pm at the Park View Rec Center at Warder St. and Otis Pl. Bring a dish to share! The Georgia Avenue Community Development Task Force will host the Georgia Avenue Holiday Party at the ECAC—733 Euclid St. NW from 6:30—10:00pm featuring food from Georgia Avenue businesses, and DJ Dwayne B. Come by and eat, dance and meet your neighbors. If you're looking for holiday gifts, or just some neat stuff for yourself, head up to the 800 block of Upshur Street on Saturday, just to the east of Georgia Avenue. They're hosting their 11th annuals Art and Craft fair with businesses, vendors and restaurants all offering items, as well as live music, food vendors and local artists and crafters. There's also a kids' fair at CrossFit Petworth just down Upshur, next to Annie's Ace Hardware, which is selling trees! 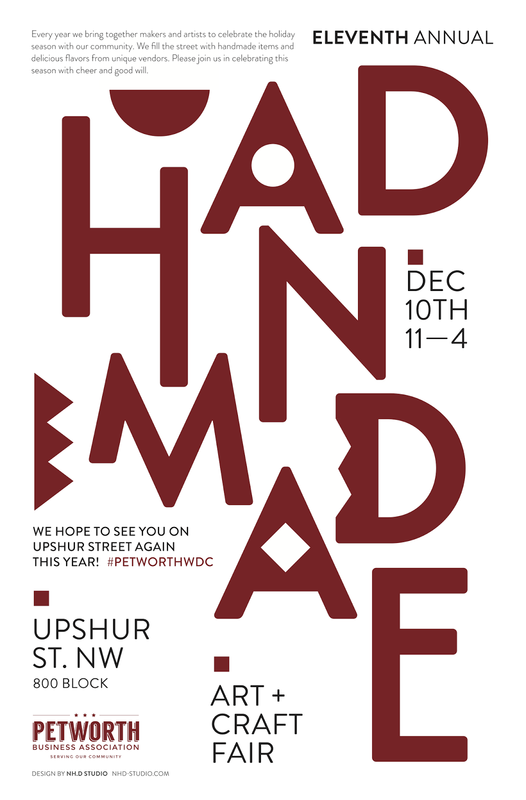 The Petworth Business Association (PBA) will host the 11th Annual Upshur Street Art & Craft Fair on Saturday, December 10th, from 11:00am until 4:00pm. 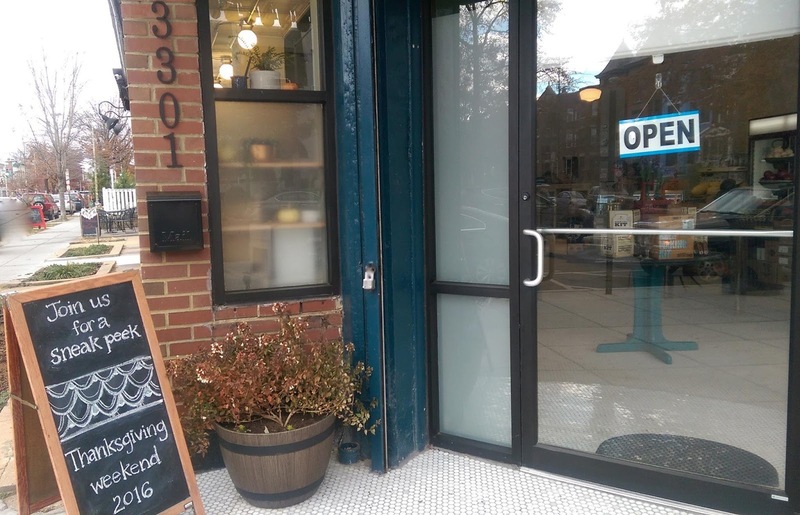 Come shop along the 800 block of Upshur Street NW in Petworth, where businesses and restaurants will be open and vendors will be lining the street selling one-of-a-kind handmade goods. If you get chilly, you can pop inside for more unique items at Willow DC or Fia's Fabulous Finds. You can also pick up a new read at Upshur Street Books, find a vintage treasure at Bentley's Vintage Furniture & Collectibles or have a bite to eat at Timber Pizza Company, Hank's Cocktail Bar, Petworth Citizen or Slim's Diner if you need a warm-up. Lighthouse Yoga Studio will be hosting their annual open house. And don't forget to head to Annie's Ace Hardware to pick up your Christmas Tree. 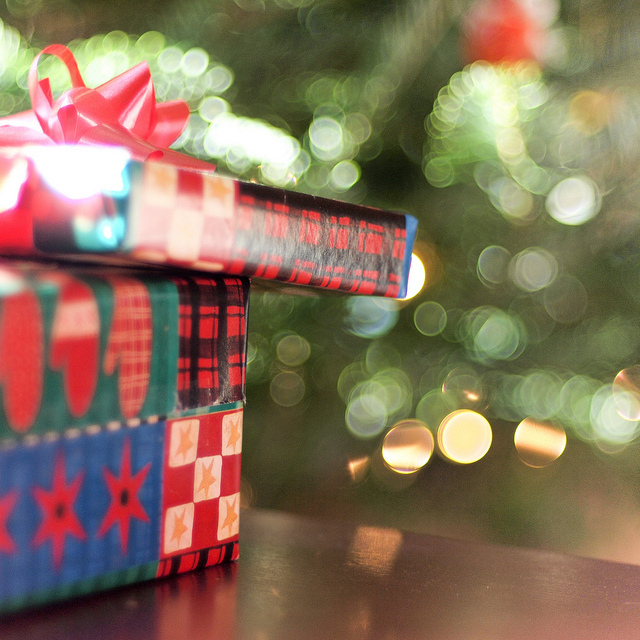 Score a great gift for your pet this holiday season at Fido and Kitty's World. This year the annual holiday market features 50+ local crafters, artists, and food vendors as well as live music performances from some of DC’s hottest locally-grown bands recruited by Listen Local First. The Upshur Street Art & Craft Fair began 11 years ago as indoor market organized by Kera Carpenter owner of the now closed Domku. Nathan Hill of Petworth based Nh.d studio has designed artwork and helped organize the fair for the last 8 years. In 2014, Julie Wineinger, the owner of Willow took the reins and expanded the fair to include a music and food lot behind Petworth Citizen. Wineinger says, "The Craft fair is my absolute favorite day of the year on Upshur Street. The Petworth community is incredibly supportive and we have such a fun time hanging out with neighbors while supporting some fabulous artisans." The 3rd Annual Kid's Fair will be at CrossFit Petworth and feature a bounce house, kid crafts and tree decorating! As is the tradition, the Petworth Public Libary will host its annual book sale the same day. The holidays are around the corner, and if you want to get a Christmas tree (or other tree for your holiday) there are a few local options I've heard about. If you know others, post them in the comments! 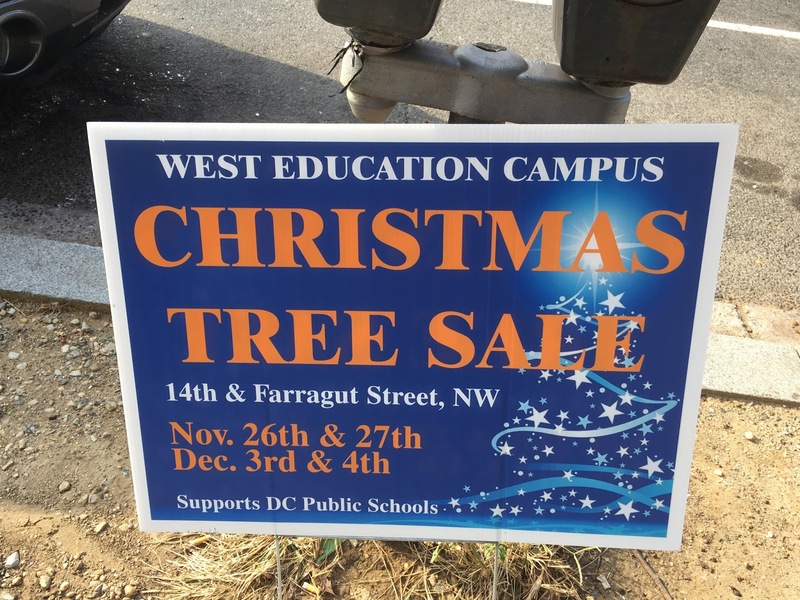 Two local schools are selling trees as a fundraiser: Bancroft Elementary in Mt. Pleasant and West Education Campus in 16th Street Heights (at 14th and Farragut.) Bancroft is selling trees this Saturday and are also hosting a holiday celebration, while West is selling trees this weekend at their school. I am not sure the hours for West. In addition, there's a local company called DC Tree Delivery which does just that -- delivers trees to you. Here's the details for Bancroft: they're selling trees this Sunday from 10am-4pm at the parking lot of McCormick Paints in Mt. Pleasant, at Kenyon and Mt. Pleasant Street NW, and they're holding a holiday celebration at the same time at the Lamont Park, just up Mt. Pleasant Street. The celebration has some fun events too: a puppet show from 11:30am-noon, Santa from noon to 2pm, and food, cocoa and face painting from 11am-4pm. We deliver Premium Fraser Firs to homes, apartments, and businesses within the Beltway, and every tree comes with delivery, a tree stand, and cleanup included. Our customers can choose between a simple tree delivery to their doorstep or the full setup of their tree within their home. Either way, we always vacuum up the needles to help take the hassle out of the holidays. Now in our second year, we are excited to bring some much needed holiday cheer to the area. Our mission is to make enjoying a fresh cut Christmas tree easier than ordering a book from Amazon. Know of any other sales? Neighborhood cleanup Saturday on Georgia Ave with free beer from Midlands! Georgia Avenue Thrive has their next neighborhood cleanup this Saturday starting at 10 am at the corner of Georgia and Morton, and they're providing all the equipment you'll need. 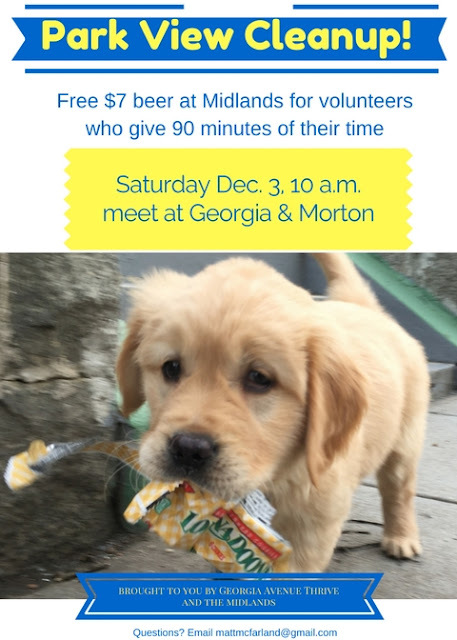 And afterwards, Midlands will give all volunteers one free beer up to $7. Can't beat that! I've been excited for this: there's a new store coming to the old Arthur's shop at 11th and Lamont. Former Room 11 staffers Jess Woods and Rachel Mowrer are opening Odd Provisions this Friday, a corner store with convenience-type goods as well as food and produce from local farms, craft beer and prepared foods like rice balls made by Seki from Izakaya Seki, the tasty little Japanese spot on V Street NW. Jess told me via email that they were very sad to hear Arthur's, which had been in business for decades, was closing but glad that they wanted to bring in another local business for the space. "We look forward to maintaining the spirit of the space and continuing to offer friendly and convenient service to our neighbors in Columbia Heights," she said. She also found some neat historical artifacts from Arthur's when renovating -- more on that soon! 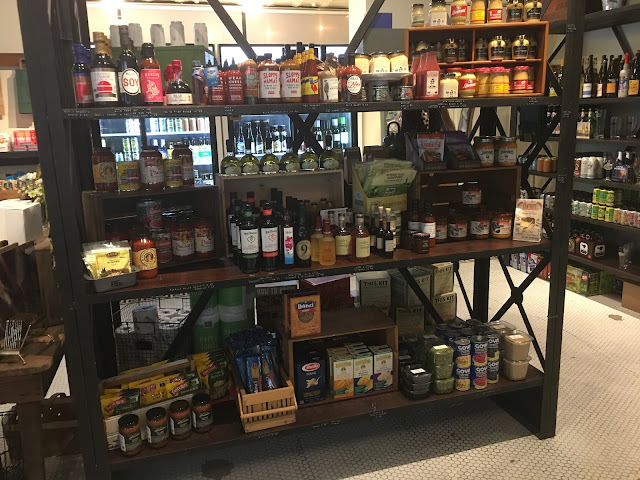 Here's a bit more from Jess, and Washingtonian has a bit too, like that they were inspired by cool corner stores in Brooklyn. They're opening at 5 pm on Friday, and there's more on their website too. 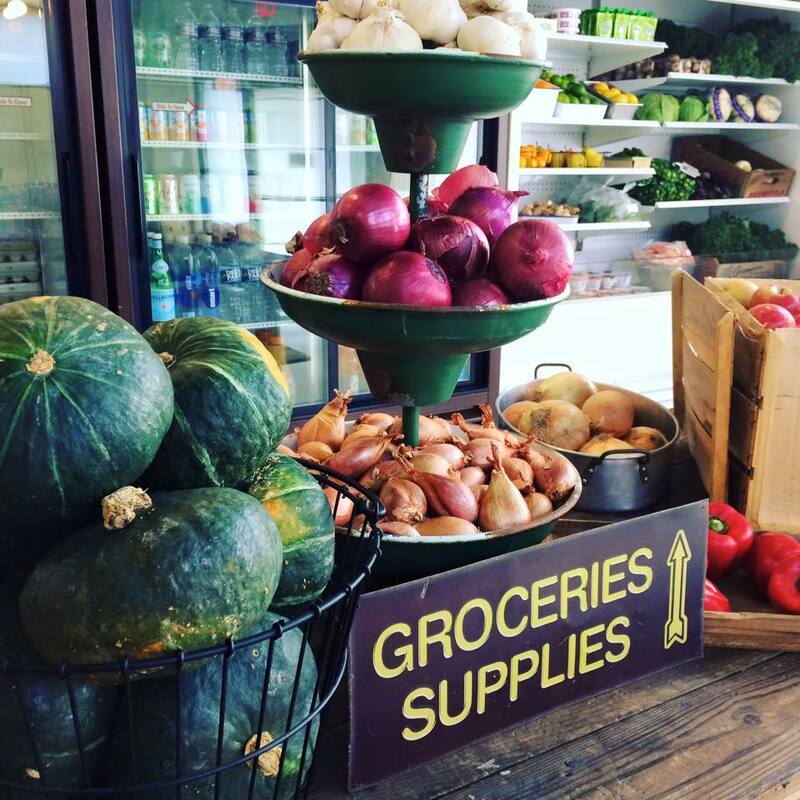 Odd Provisions will be a contemporary corner market offering a mix of traditional convenience items, specialty foods by local artisans and produce from local farms as well as craft beer and wine. 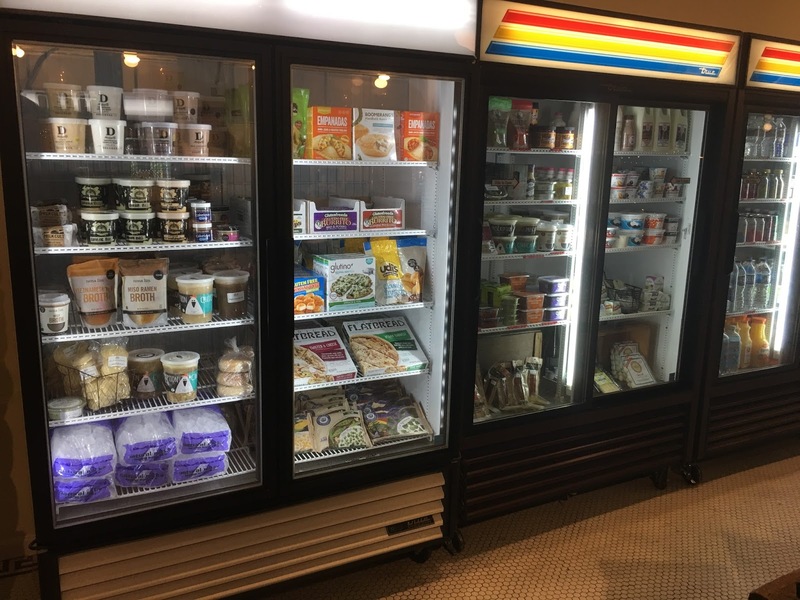 We'll be offering a small assortment of prepared foods, including stocks and broths, grab-and-go sandwiches and salads, with made-to-order sandwiches coming next year. We'll also be partnering with local chefs to offer their dishes in a convenient take-home form. I'm pretty excited that there's a cool replacement for Arthur's, and that we're getting more retail in the neighborhood. I think that's something we are really lacking. They had a preview on Saturday, here are a few more photos from that via their Facebook.